If you find yourself wondering what the heck I'm talking about, please see part one of this story here: "One, the Sun!" 6 - a drop down into a deep room filled with huge crystals... OR a beehive loaded down with honey (the sound of buzzing is a nice effect). I did the crystal story with Sunburst, and her characters had to actually stack up the crystals to climb out. Luckily, they were able to carry just one back to the dragon. With Moonshine and Kitty Bill, the treasure was a bit of honeycomb, and we were mesmerized by the perfect six-sided forms. 7 - this tunnel leads out to the afternoon sky where the rainstorm is ending. And of course they see a the most glorious rainbow. 8 - a spider web with a spider. This one landed on the prince's head! My son laughed so hard he fell out of his chair. 9 - they meet a fox who had previously stolen the dragon's 3 golden scales. If they can answer a riddle, he will return the golden scales. If not, well... they must agree to lead him out of the cave and he keeps the scales. I used "When I was going to St. Ives..." and changed the central number in the riddle from seven to nine. We drew three golden triangles (dragon scales) and noticed that there are not only nine points, but nine lines as well. 10 - they find fireflies, but this poses a problem, for without jars how will they catch ten? Or do they need to catch ten? ---With a bit of make believe firefly catching, we come to the stunning realization that it is the child's hands which holds the treasure of ten. Now this is where the Quality of Numbers lesson gets a bit fuzzy, because not one of the resources I have ever encountered mentions any suggestions for the number eleven. Like the last day of creation in the Grade 3 Creation study, the number eleven gets no mention. 11 - When I first tried teaching this block, I tried to stay in the natural world for number eleven. I couldn't think of anything, so I settled in with a suggestion from my good friend Moxy Jane to use moonbeams. That worked okay for Sunburst, but by the time I taught Moonshine, I had realized there wasn't a wrong answer for this number. Eleven is simply ten plus one more, and it doesn't matter what you're counting. So you might as well make it fun! For Moonshine's story, at the end of the eleventh tunnel there was an eleven-piece matryoshka doll (for a girl who has a VERY soft spot for nesting dolls, this was a real treat). And for Kitty Bill, who has been developing a new interest in all things dinosaur, there was a shovel and the boys dug up eleven dinosaur bone segments. (Yes, segments, because as you and I know, eleven bones does not a skeleton make.) He was thrilled, both by the story and by the drawing. "For number eleven: I used Joseph's dream of the eleven sheaves of corn bowing to him. You could also use the eleven stars bowing down to Joseph in his second dream. For another, more grade one-like, idea: H.C. Andersen wrote a fairy-tale called "The Wild Swans," which is about eleven swans (eleven brothers). That would be perfect I think!" There are a few different things people use for the number twelve-- a clock, a dozen eggs, the Twelve Dancing Princesses... They all felt like such an anti-climax for me. I wanted to end the story with something marvelous, and in my exhaustive search I found a very strange video that spoke to me. I called it further proof that inspired story ideas can come from anywhere, including marketing videos designed by internet marketing firms. Who knew?! 12 - this tunnel opened up directly upon a field of twelve horses all under an enchantment. As this was the final tunnel, it was our most outrageous story. The story characters had to figure out A. why aren't the horses responding?, and B. how to break the enchantment. It was a favorite with both the girls and Kitty Bill, and it really spoke to them deeply. I borrowed the above "legend" and the horse constellation for our "twelve" picture, but in my version of the story the chariot belonged to the Sky Queen. The adult in this story remembered the legend and shared it with the kids, who exclaimed, "These must be the horses!!" But how do we break the enchantment and bring them back to the dragon? The characters in the story tried many things-- as many things as my children could think of to "wake up" the horses... yelling, whispering, sitting on them, pinching them, tickling them, kicking them... it went on and on, until finally, they sat to ponder the problem over lunch. The main character took out his handwork, and as he worked, he began to hum. A horse twitched! The other characters noticed, and after much guesswork, they began to put the clues together. There was a lot of humming, but this only produced twitches from the horses... curious! Finally, with much guesswork on behalf of both the characters and my child, our main character decided to sing from his heart. "Ponies, now ponies, don't you worry. I'm not here to steal your fire away. I want to fly with you across the sunrise. And remember what begins each shining day." --the chorus from "Ponies" by Michael Martin Murphy. As the character sang to each horse, it awoke from the enchantment. Each time we sang, it was louder and bolder, until we were bursting with song. The pure delight and joy on each of my children's faces, on the separate occasions they heard this story, was priceless. It touched something deep in their hearts and souls that I can't even begin to put my finger on. But these moments? That's what homeschooling is about! After the enchantment was broken, the dragon came soaring out of the cave to thank and congratulate them. The Sky Queen, in all her radiance, appeared before the story characters. She thanked them dearly, and presented the story child who first broke the enchantment with a special gift... a flute made from the magic pear tree. This was the GREATEST GIFT (as the video legend says and thus interpreted by me) --giving them the means with which to communicate without words and with nature itself. Music is its own kind of magic, after all. At the end of this lesson, I presented my child his/her very own flute made from the magic pear tree --the quinta Choroi pentatonic flute. It's with this flute that, at the end of the alphabet lesson, our characters can call an animal friend for a lift home-- for Sunburst and Kitty Bill it was the dragon itself, and for Moonshine it was a great white bird. This was another one of these moments that no words can adequately describe, but I feel like presenting them with their very own flute in this way gave them a heightened reverence for it. Music touches us so deeply, both man and beast, and I wanted them to start out on that footing. This is a special way of communicating. Guard it wisely. Honor, revere, and develop it. And know that music is a sacred gift. Of course this was the end of our first mathematics story, which was really just a story inside another story. Filled with joy and happiness, we then continued on with the original alphabet journey which culminates in a cheerful, happy ending. Afterwards, the flute accompanies us as we work our way into another form drawing block and on into another maths lesson. As for the last few drawings above, I left those completely up to my children to work on independently. Funnily enough, they each chose to draw the horses, the Sky Queen, and the dragon. These are all Kitty Bill's drawings and text. I am completely charmed by his red dragon, golden scales and all. Sorry to have disappeared for a bit. Our last two months were filled with a lot of things-- travel, snow, holidays, illnesses, celebrations, and of course homeschooling. I also finally finished painting all the wooden furniture as a protection against future mold. While I prefer the color of natural wood, I will admit that I am really liking the bright new colors. Lime green and turquoise make me smile. In my last post I mentioned a possible move on the horizon. In the end, we decided not to take the job offer up north. Making decisions about our future is often agonizing-- weighing all the pros and cons, ifs and whats. I often feel like we're living in some alternate retelling of the Grimm's tale The Fisherman and His Wife as we weigh things like cost of living, location, homeschooling environments, and lovelier views over the landscape. And where does it all stop? I'm not going to deny that, like the fisherman's wife, I have often wished I could control the rising sun. However, I don't think this makes me any different from the other people on this rainy island. At the end of winter we're all a bit sullen and desperate for warm sunshine. As luck would have it, these early days of March have been quite sunny. The kids and I are loving sitting in the sunshine every morning. It's a bit blinding at times, but I'm not complaining. I feel like a bear unfurling from her wintery sleep. It's amazing how a few days without clouds can be so rejuvenating. Inside this den, my days have been so busy. Homeschooling my three has definitely become more than a full-time job. I know that others manage to homeschool even more children than I have and still find time to blog, but for the life of me I can't figure out how they do it. I have some theories (mostly involving gremlins), but suffice it to say that I wish I had more time in the day to share the wonderful things that are happening over here. These children continually leave me awestruck by their growing minds and abilities. We've also taken a couple of field trips with the not-quite-local homeschooling group. One of which was to the little butterfly house in Stratford-upon-Avon. 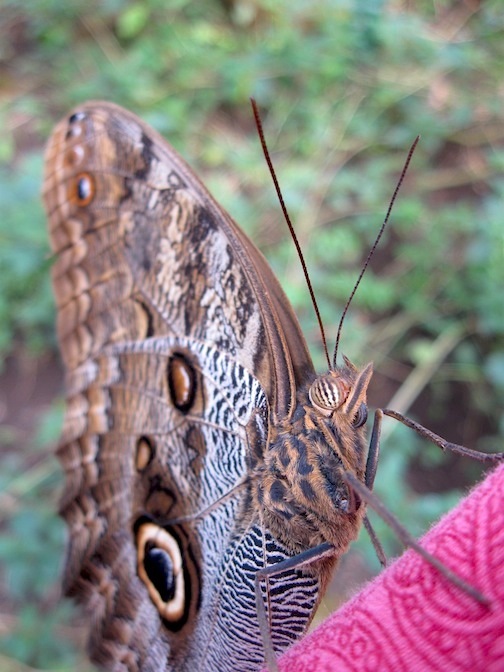 I'm not sure what I loved more-- seeing all the amazing butterflies or being so warm that I had to take off my sweater. It was a nice change! The last time that happened we were in Italy. Speaking of change, there is more of that afoot. I'm reminded of a card my mother-in-law gave me while we were sorting and packing for our move to Switzerland five years ago. It said, "If nothing ever changed, there would be no butterflies." --Our lives are so full of transitions, I think of that card fairly often. Einstein recently received some grant funding that necessitates a temporary move to Italy for some unknown quantity of time this summer, and he has also been invited to apply and subsequently interview for another job-- this time on the mainland. It's almost funny. All of these transitions definitely make me think about butterflies-- do they know what's happening when they closet themselves up? Are they cognizant of their own form metamorphosing... of what their future holds? I watched some of them emerge bleary-eyed and soggy from their chrysalises, and they didn't quite seem to have it all together. I can relate to that. Some of them found a perch where they could drip dry, but some of them didn't. They fluttered about in a wild panic, but were weighed down by their damp wings. They hit the stone walkways with an inaudible whack and just lay there stunned by their own predicament. One minute they are a fat caterpillar, the next minute they're stewing in their own soup. And next thing they know? They are airborne into a completely different creature. What am I? Where am I? What has happened to me? Again, I can relate. Moving overseas with children has some stinging similarities. 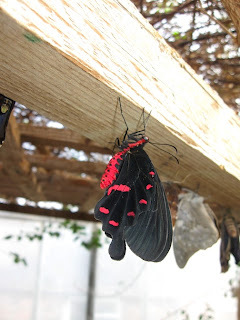 So I hung around the chrysalis cage for awhile and gingerly picked up my fallen comrades. Not all of them were going to make it, but a few of them gave it another try. They latched onto a branch and hung there in stunned silence, feeling the heat warm the last few drops of soup from their bright wings. Kind of like these cute ants. Steadily onwards.